Back in January McDonald’s lost its rights to the trademark “Big Mac” in a legal battle with Irish burger chain Supermac’s. Almost immediately after the loss, Burger King Sweden rolled out some new menus in their stores taking advantage of the ruling which allows other companies as well as McDonald’s to use the “Big Mac” name in the EU. 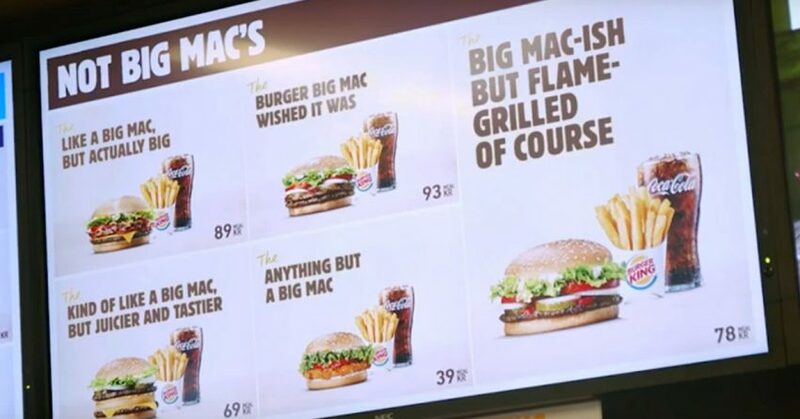 The revamped menus under the title of “Not Big Mac’s” list several options like “Like a Big Mac, But Actually Big”, “Burger Big Mac Wished It Was”, “Kind of Like a Big Mac but Juicier and Tastier”, and “Big Mac-ish But Flame-Grilled of Course”. Burger King Sweden released a video showing customers ordering from the menu. This ad is the latest in a long history of Burger King trolling McDonald’s. Late last year, Burger King offered Whoppers for one penny through their mobile app to customers as long as they ordered it from a McDonald’s. Queen Elizabeth turns 93 years old this weekend.Is it time for her to give up the throne?